Chances are you&apos;ve seen a "green wagon" featured in most all of our recent creative and imagery. That is no coincidence, let me give you a little background and history on one of our CVB&apos;s most engaging promotional campaigns to-date. In late 2014, the CVB&apos;s strategy and steering committee formulated the concept and began the hunt to fulfill the idea. 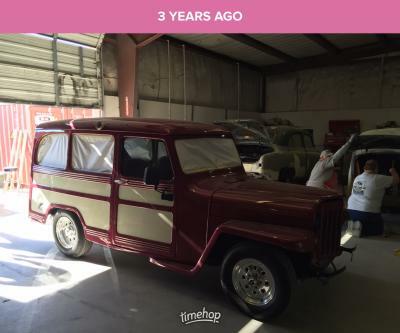 We came across a 1957 Jeep Willys that was painted a not so pleasant glitter maroon. After a quick inspection, the CVB purchased the Willys and our restoration efforts began. The Willys is our traveling "booth" if you will. So it needed to be a show stopper and ready to grab attention for New Braunfels. Colors schemes were presented and the final result was a mild tone green with classic teakwood paneling. This nostalgic tapestry harkens back to the days of when Landa Park was the destination for road trippers. Many travelers would enjoy a picnic alongside the springs and its lush landscapes. Since New Braunfels has been hosting Texans for generations, and the springs still flow, this ties directly into our campaigns of today. The Willys loves being in front of the camera, or out at a show flashing about while stuffed to the gills with brochures and giveaways. The CVB staff enjoys getting a few extra moments to make a genuine New Braunfels impact on prospective visitors with the Willys support. On select weekends in New Braunfels you can catch the Willys at local hotspots hosting media and press teams. Yep, it does run, thanks to a Chevy 350, and it even has air conditioning!